It’s not done all that often, but the art of braiding three plants together into one plant creates a truly unique and unusual plant. This photo is three Japanese Red Maple tree seedlings braided together to form one very interesting tree. Thomas has done an incredible job with his Backyard Nursery since Joining my program and the creation of this tree is a testament to the passion that he has for plants. I’ll explain the process of braiding in a second, but first take a look at the photo. That’s three different trees braided into one. Because these are Japanese Maple seedlings (trees grown from seed not grafted) each one is unique and not identical in a way. Grafted plants, or plants grown from cuttings, are usually exact clones of the parent plant because they contain the exact genetics as the parent plant. Trees grown from seed will not be an exact match to the parent plant, and in this case it’s a huge benefit because each one of these little trees is displaying a different fall leaf color. Amazing and beautiful! Can you imagine how interesting this tree is going to be in 20 years? That’s why I love plants. They bring people constant joy! 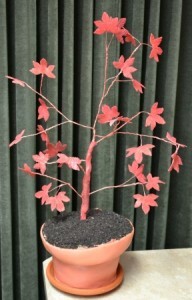 To create this tree all Thomas did was take three Japanese Red maple seedlings and pot them in the same container. Then he braided them as you can see in the photo and secured them in place so they would stay braided. When I am training plants I will often use duct tape to secure them in place because I have found that after about 12 months out in the weather the duct tape dries out and will eventually fall off. That’s really important because if you use something that is non biodegradable that stays in place forever, the binding will cut into the plant and eventually girdle the plant and cause serious damage to the plant. With duct tape, if I forget to remove a wrap, or don’t see one when I am removing them, it will usually remove it’s self at just about the right time. Japanese Red Maple Trees are actually quite easy to grow from seed and they are hot, hot, sellers! Detailed instructions about how to grow them from seed are here. I need more people who would like to grow and sell Japanese Red Maple tree seedlings. I buy thousands of them myself! Why do I buy them if they are so easy to grow? Because I am impatient! I want them now, as do thousands and thousand of other plant enthusiasts around the country. I just bought 400 of them this fall and I will order 1,000 more for spring. Because they sell like crazy. All of my member/backyard growers want them. They need them! They have customers asking for them. They need them to sell, and they need them for grafting. I’m telling you, this is a hot item! But . . . if you really want to do this right and not make a bunch of mistakes that can be avoided, you have to get my Backyard Growing System. Why? Because as one of my customers I’ll show you where and how you can sell your plants online without a website and without any marketing of your own. I have a lot of members who sell thousands and thousands of dollars worth of plants right from home using this resource. Not sure? Reluctant to make a decision? Read this. It is a beautiful group of trees. Although you expressed concern about a tie girdling a tree, won’t these trees eventually girdle each other? Steve, I think the general thinking is that as they grow the braid will stretch with the tree, but I supposed it’s possible. However, tree braiding is something that has been done for a long time, so I don’t honestly know for sure. I’d still take that chance. Won’t they simply grown together? What a beautiful tree!! Georgeous color and such a unique idea! I tired to access your link to blueleatherplants.com and it says its under construction. I love the braided japanese maple so if there was an error could you give me a good web address. Karen, his site is under construction, but I included the link so it will work once he gets the site up and working. Love the braiding of the Japanese Red Maple! I have done this with a benjamina ficus tree in my home which I have been growing for 34 years. It makes it strong, tall, and stately looking! Thanks, Mike! Hi Mike, I already have your backyard grower’s system, though if you have it in a book form, I’d love to get the book. Trying to read instructions off your computer is a PITA! I do not have any Japanese maple seeds right now to start, but I have lots of space to grow them. So – if I start gathering seeds this spring, what would be the best way to start them at that point? Sand? Compost and vermiculite/perlite? Compost and sand? (I have access to a gorgeous compost heap of years old horse manure and sawdust composted into rich, black (thick) compost. Which of these would be the best option? Or something else? I see people with red maple trees everywhere. I’m going to talk to them and offer to pay if they’ll gather some of the seeds for me, so I’ll have a nice variety of them. I just need to know the best way to start them once the growing season is already under way. I would like to know if the Japanese Red Maple is hardy in southern Minnesota (zone 4, marginally zone 5). My son tried the braiding technique on some crab apple seedlings we planted 3 years ago. It is a beautiful tree now about 6-7 feet tall. He used only 2 trees, twisting them around each other. Gwen, zone 5 is fine, zone 4 a little iffy. Me? I’d go for it. Life is too short not to try. Wow that tree is sublimely beautiful, or should I say trio of trees? I think I just might buy the system for christmas! First, thank you so much for your emails and videos. They are so inspiring. My question is about the tree trunks and roots being so close together. I know you said can you imagine these in 20 years. But will the trunks or roots of the 3 trees being together strangle each other out eventually? Will one overpower the others as they grow? Deborah, I really don’t know the answer, but plants are like people and they adapt. I certainly would not hold off on getting one of these trees for what it may or may not look like in 20 years because I would enjoy it a great deal between now and then. Mike that Maple tree is awesome. Wish we had maple in Seychelles. If only someone could send me some seeds I would definitely give it a try. I will send you $47 soon. I cannot use a credit card. My CPA doesn’t want me to use it. A check is ok if I am told where to send it. I’m in the process of buying a Lion Head Japanese Maple. My lace Leaf Japanese Maple did not show any seeds this fall. When do they produce them? What happens with the braided trees as they get older? Do the trunks strangle each other? Jay, not that I am aware of, but that’s a good question. I have 4 crape japanese red maples braided.I also have 6 crape myrtles braided, l planted them different colors in a section and the really make a great show when they bloom. I like the maples, i been braiding trees every time i go into the woods to deer hunt. I have a green maple in my yard that i braided about two years ago. 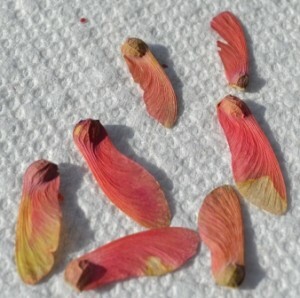 I like toget the japanese red maple seeds. The three colors do look good. I have 1 redwood greenhouse and 7 acres in zone 6,7 in Northern Az. I am interested in all types of Maples, especially dwarfs, rare types, and rare Bonzai varieties. Norma, zones 6 and 7 are nearly perfect for growing plants, especially Japanese Maples of all kinds. We have a member that offers a huge selection of Japanese maples to our group. He usually takes orders in Jan and ships in late Feb or March. Fantastic deals! I’ve bought thousands of dollars worth of plants from him. Mike — I purchased your system years ago, but am just now starting out. I live in southern Illinois, zone 5 — I planned a few flats of (Jap Maple and others)this fall. Do I have to worry about the winter killing them? If so, is there ANYTHING I can do to prevent it from happening (like cover them w/plastic, etc? I would love to grow japanese red maples and have been seriously considering buying your system. I have lots of room but I also have lots of deer that wander through. Will the deer eat the small seedlings? They have eaten my fruit trees up as far as they can reach. I would try bitter apple spray. I’m not sure it would work, but you can get it at the local pet store. It works for dogs. Might be worth a try and it’s cheap too. Mike, I’ve got one Japanese Maple (green) outside my front door. After seeing your sons pruning project, I began to get curious about the different varieties. Braiding definitely seems like a great and unique idea. I’ve got dozens of seedlings growing all around the large tree. If you don’t mind, what’s the best way to pot the seedlings for survival and strong growth before it starts getting too cold?